Aerating with a roller or a walk-behind is fine if you don’t have a lot of ground to cover, but if you’re a commercial operator, they can really slow you down during the fall rush. 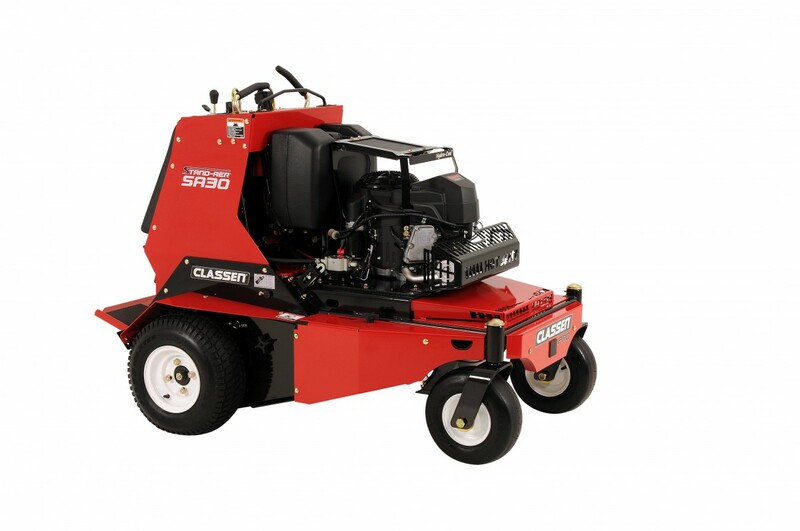 Classen PRO’s Stand-Aer solves this problem by building an aerator around a stander mower design, greatly increasing speed and cutting width. Have a rental business? The design of the Stand-Aer doesn’t just make it quick, it’s also easy to operate, earning it a Rental Magazine Editor’s Choice Award. The Stand-Aer is powered by a Kawasaki FS541V. It has all the features you expect from a commercial motor including full pressure lubrication and a dual element air cleaner. 15 hp may not sound like much, but since it only needs to power the hydraulic system and the tine reel, it’s a good match for the Hydro-Gear ZT3200 transaxles used in this unit. Hydro-Gear uses thick axles and shock valves to improve durability, and the oil filter is external for easy maintenance. Classen takes reliability a step further by fitting the hydraulic system with their Hydra-Cool system to keep fluid temperatures under control. The tine reel uses a chain drive with an automatic tensioning system to reduce maintenance. Working on this aerator is simple thanks to integrated jack stands lift aerator two inches for maintenance access. The controls on this aerator work like any stander ZTR mower: there’s a control panel in front of the operator with a grip for balance and a pair of levers to control the speed of the hydraulic motors. A thumb switch engages and disengages tines, going from transport to aerating over 25% faster than the leading stand-on. A tine depth stop allows the core depth to be set at one of 7 depths between two to 5 inches to fit soil conditions. The rider platform is mounted on shock absorbers for comfort and stability. It can be flipped up to use the Stand-Aer as a walk-behind in tight spaces and to make the unit more compact when storing or transporting. 18 inch Grass Master tread drive tires in the back and a set of large caster wheels in the front reduce scrubbing to protect the turf. With the tines fully raised, this aerator has 6 inches of clearance, letting it drive over most curbs. Obviously, the Stand-Aer has a huge advantage when it comes to speed: with a top speed of 7.4 mph going forward and up to 3.5 mph in reverse, it covers three times as much turf as a walk-behind aerator. However, the design also brings with it superior maneuverability. With the tines engaged, the Stand-Aer has a turning radius of just 48 inches, in many cases eliminating the need to stop and line up for the next pass. Lift the tines out of the ground, and it steers just like a ZTR, letting you get just the right position in tight spaces. The tine reel spreads the work across 48 ¾-inch (19 mm) hollow core tines. With a width of 30 inches, the reel leaves behind a 3 ¾ inch by 7-inch (95 x 178 mm) pattern at 5.1 holes per square foot. Classen guarantees this aerator for two years when used for either commercial or rental use, while Kawasaki covers the engine for three years. Shank’s Lawn Equipment is more than just a Classen dealer, we’ve been helping professionals with their lawn equipment for over three decades, so we can help you get the tools you need and keep them running. If you need anything for your Classen PRO, visit our shop, located at 4900 Molly Pitcher Highway, Chambersburg, PA. To get here from I-81, take Exit 10 to Marion. Need parts for your Classen PRO equipment? We ship parts and accessories across the U.S. and Canada. To order, visit our website, www.shankslawn.com. This entry was posted in Uncategorized and tagged Classen parts, Classen Stand-Aer ZTR Aerator, Shank's Lawn. Bookmark the permalink.